All Roof-Line Series joint covers come standard with a water/wind barrier and top seal gaskets for the centre plate screw of the flat roof cover. All Latham Roof-Line Series flat roof and roof-to-parapet covers are supplied with 1 splice plate per full length which is for installation over the junction between 2 plates to maintain water tightness. As standard the Roof-Line Series covers are supplied in mill finish aluminium, although they can be successfully powder coated or anodised to harmonise with the surrounding finishes. End Closures, Transition Splices, Corners and Tees should be considered for all Roof Lines Series expansion joint covers. For further details of available profiles, view and download the roof details here. The Latham Roof-Line Series Shallow aluminium roof range of expansion joint covers can be installed on a flat slab or hob. All Roof-Line Series joint covers come standard with a water/wind barrier and top seal gaskets for the centre plate screw of the flat roof cover. 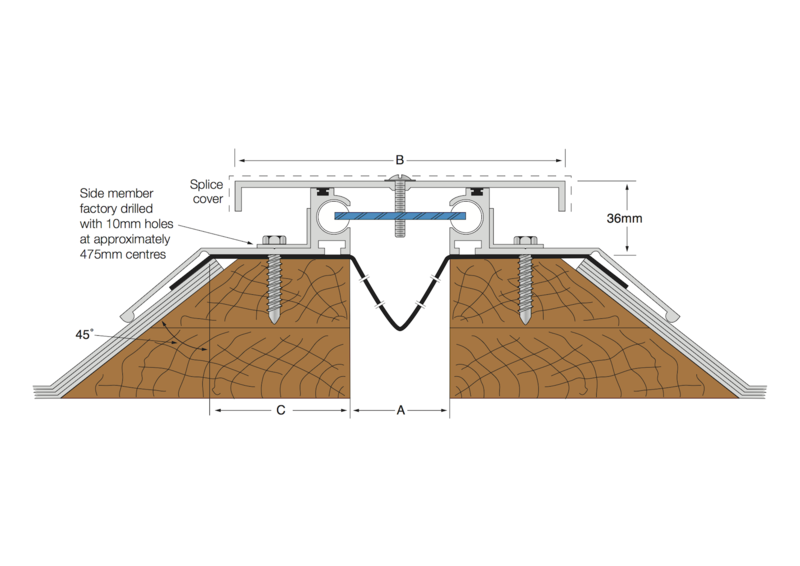 All Latham Roof-Line Series roof expansion joint covers are supplied with 1 splice plate per full length which is for installation over the junction between 2 plates to maintain water tightness. 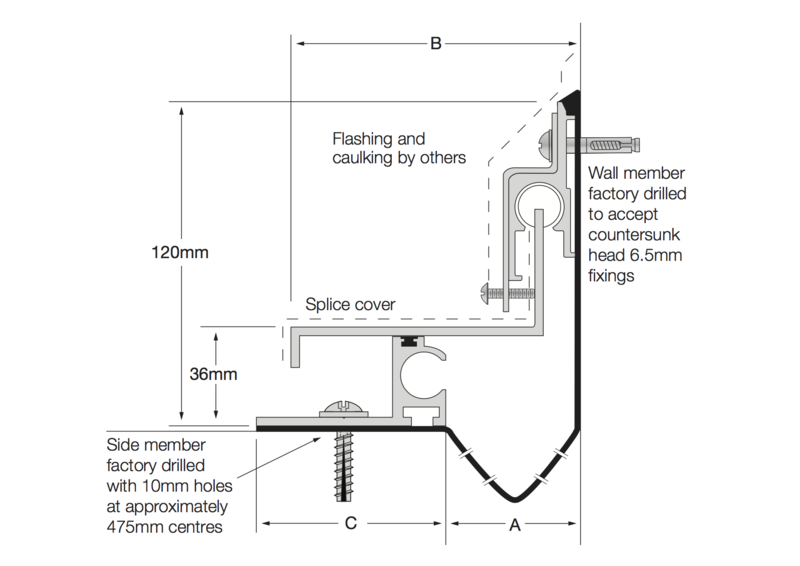 When the expansion joint width is 50mm or wider, the series can accommodate the Latham Fire Barrier System. As standard the Roof‑Line Series joint covers are supplied in mill finish aluminium, although they can be successfully powder coated or anodised to harmonize with the surrounding finishes. If this is required please contact a Latham representative to discuss the application. 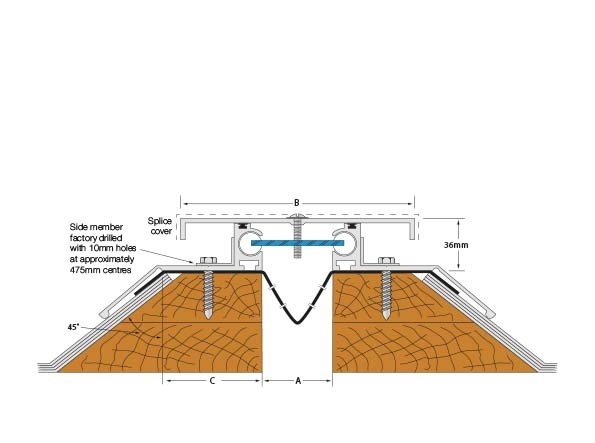 End Closures, Transition Splices, Corners and Tees should be considered for all Roof-Line Series expansion joint covers. The Latham Roof-Line Series Shallow aluminium roof-to-parapet range of expansion joint covers can be installed on a flat slab or hob. All Roof-Line Series joint covers come standard with a water/wind barrier and top seal gaskets for the centre plate screw of the flat roof cover. 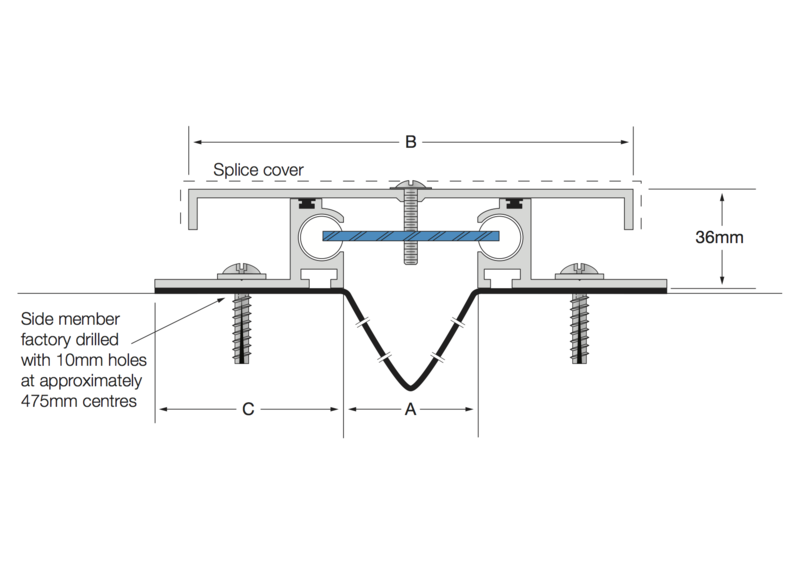 All Latham Roof-Line Series roof-to-parapet joint covers are supplied with 1 splice plate per full length which is for installation over the junction between 2 plates to maintain water tightness. 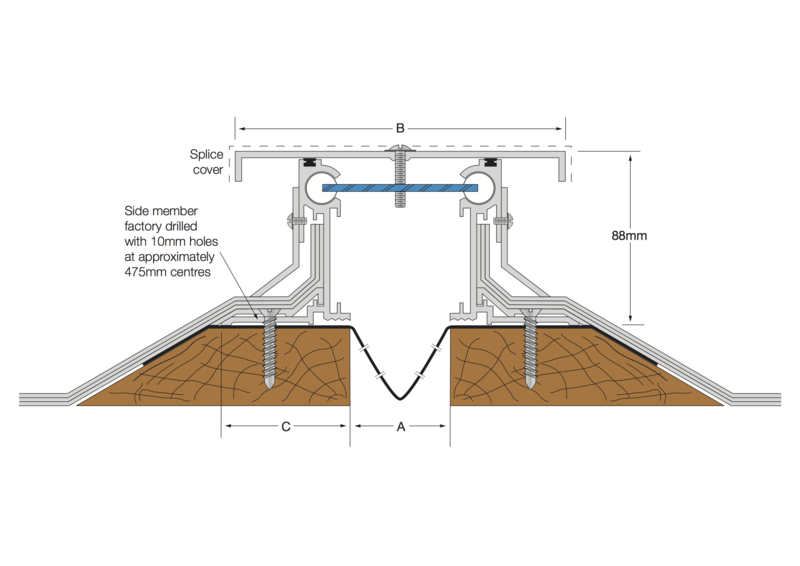 When the expansion joint width is 50mm or wider, the series can accommodate the Latham Fire Barrier System. The Latham Roof-Line Series Elevated aluminium roof range of expansion joint covers offer the best protection against water penetrating through the roof slab joint. The range can be installed on a concrete or timber hob. The elevated side members are installed high above the slabs. 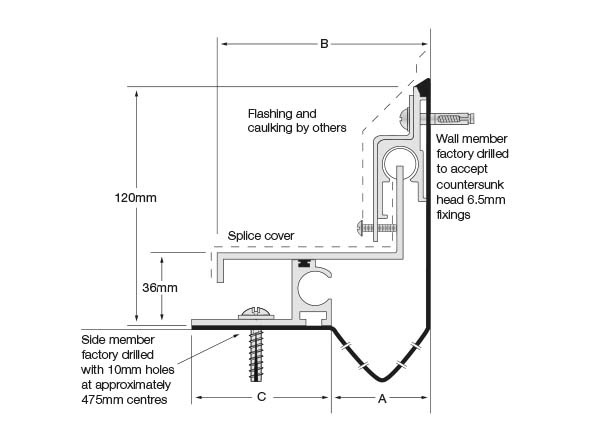 The slab membrane should continue to the side member and membrane hold down clips are supplied for installation at approximately 500mm centres. All Roof-Line Series joint covers come standard with a water/wind barrier and top seal gaskets for the centre plate screw of the flat roof cover. All Latham Roof Line Series flat roof covers are supplied with 1 splice plate per full length which is for installation over the junction between 2 plates to maintain water tightness. When concrete hobs or continuous up stands are used and the expansion joint width is 50mm or wider, the series can accommodate the Latham Fire Barrier System. As standard the Roof-Line Series Covers are supplied in mill finish aluminium, although they can be successfully powder coated or anodised to harmonize with the surrounding finishes. If this is required please contact a Latham representative to discuss the application. End Closures, Transition Splices, Corners and Tees should be considered for all Roof Lines Series expansion joint Covers. The Latham Roof-Line Series Elevated aluminium roof-to-parapet range of expansion joint covers offer the best protection against water penetrating through the roof slab joint. The range can be installed on a concrete or timber hob. The elevated side members are installed high above the slabs. 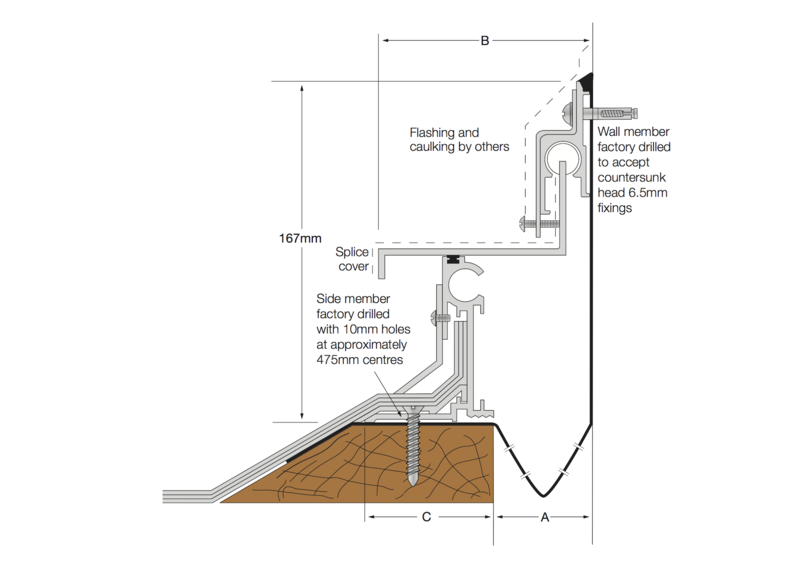 The slab membrane should continue to the side member and membrane hold down clips are supplied for installation at approximately 500mm centres. All Roof-Line Series joint covers come standard with a water/wind barrier and top seal gaskets for the centre plate screw of the flat roof cover. 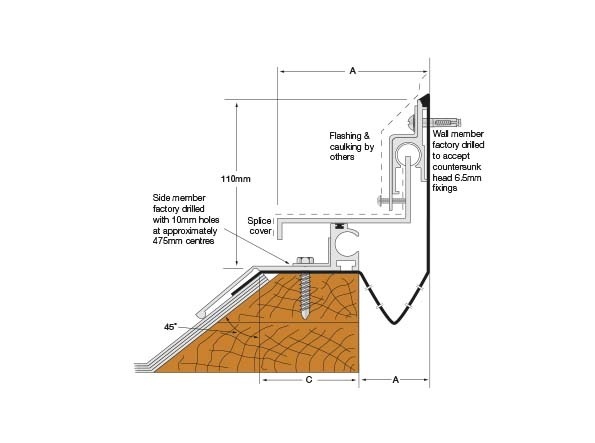 All Latham Roof Line Series roof-to-parapet covers are supplied with 1 splice plate per full length which is for installation over the junction between 2 plates to maintain water tightness. When concrete hobs or continuous up stands are used and the expansion joint width is 50mm or wider, the series can accommodate the Latham Fire Barrier System. As standard the Roof-Line Series Covers are supplied in mill finish aluminium, although they can be successfully powder coated or anodised to harmonize with the surrounding finishes. If this is required please contact a Latham representative to discuss the application. 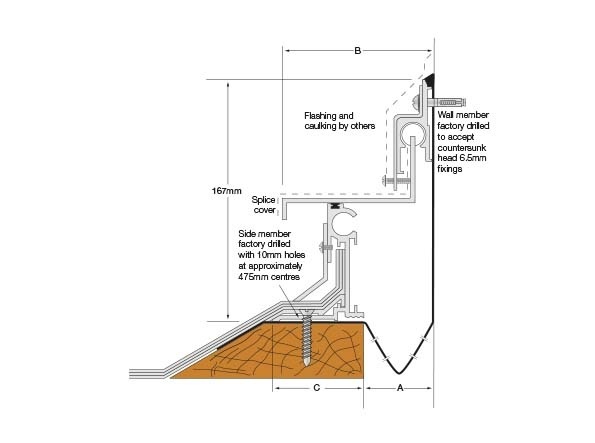 End Closures, Transition Splices, Corners and Tees should be considered for all Roof Lines Series expansion joint Covers. The Latham Roof-Line Series Standard aluminium roof range of expansion joint covers offer the best protection against water penetrating through the roof slab joint. The range can be installed on a concrete or timber hob. The elevated side members are installed high above the slabs. The side member is designed to assist in holding down the membrane material. All Roof-Line Series joint covers come standard with a water/wind barrier and top seal gaskets for the centre plate screw of the flat roof cover. All Latham Roof Line Series roof joint covers are supplied with 1 splice plate per full length which is for installation over the junction between 2 plates to maintain water tightness. When concrete hobs or continuous up stands are used and the expansion joint width is 50mm or wider, the series can accommodate the Latham Fire Barrier System. As standard the Roof-Line Series joint covers are supplied in mill finish aluminium, although they can be successfully powder coated or anodised to harmonize with the surrounding finishes. If this is required please contact a Latham representative to discuss the application. 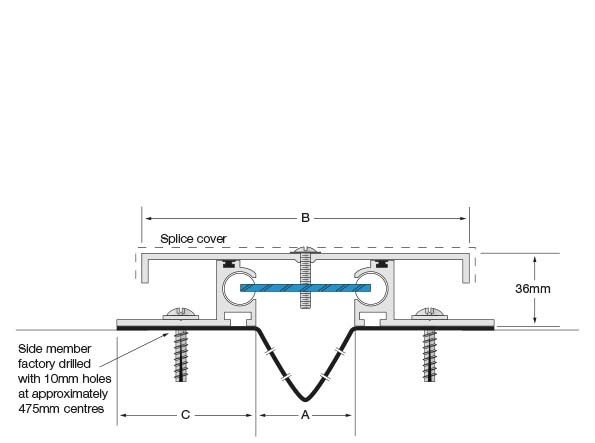 End Closures, Transition Splices, Corners and Tees should be considered for all Roof-Lines Series expansion joint covers). 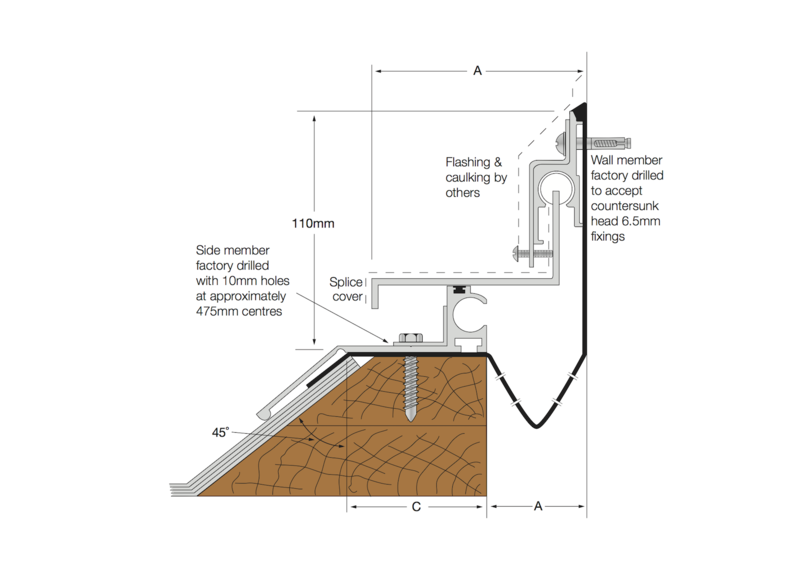 The Latham Roof-Line Series Standard aluminium roof-to-parapet range of expansion joint covers offer the best protection against water penetrating through the roof slab joint. The range can be installed on a concrete or timber hob. The elevated side members are installed high above the slabs. The side member is designed to assist in holding down the membrane material. All Roof-Line Series joint covers come standard with a water/wind barrier and top seal gaskets for the centre plate screw of the flat roof cover. 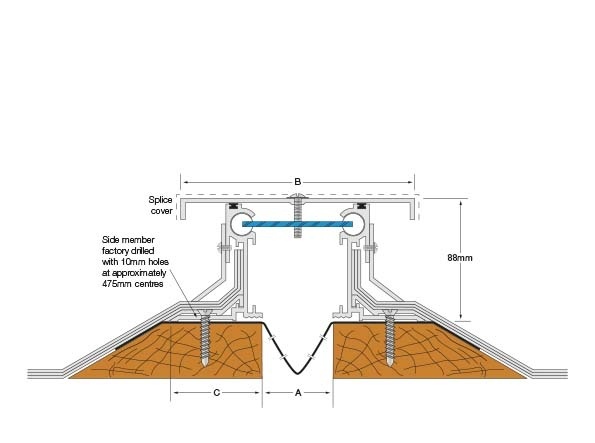 All Latham Roof Line Series roof-to-parapet joint covers are supplied with 1 splice plate per full length which is for installation over the junction between 2 plates to maintain water tightness. When concrete hobs or continuous up stands are used and the expansion joint width is 50mm or wider, the series can accommodate the Latham Fire Barrier System.